Offering an appealing array of luxurious self-drive watercraft, Le Boat provides wine tourists an unforgettable way to experience the south of France as they travel along the Canal du Midi. This historic waterway winds through the beautiful Languedoc-Roussillon countryside, and Le Boat gives visitors a chance to enjoy every inch of it at their own relaxed pace. No special license or boating experience is required, so advance trip planning is easy. Vacationers have a fleet of boats to choose from, depending on their party size (from two to ten) and their desired route. Le Boat offers five different ports of origin along Canal du Midi, and a long list of suggested one-way and round-trip itineraries to satisfy a variety of interests. Vessels can be hired by the week, or for “short breaks” of three to five days during certain times of year. Although Le Boat offers many helpful itineraries, guests are always welcome to create their own. Each vessel features stylish décor and furnishings. The sleeping cabins are attractive and comfortable with double, single or bunk beds covered with fluffy pillows, duvets and bed linens. 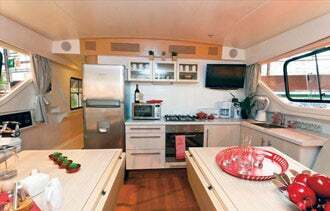 The kitchen galleys are fully equipped with refrigerators, gas ovens and cooking utensils. The bathrooms boast hot showers and pump- or electric-flush toilets. The sun decks are fully equipped as well with safety equipment, deck equipment and tables, chairs and umbrellas suitable for outdoor use. Le Boat’s vessels provide a great deal of flexibility, allowing them to accommodate parties in a range of sizes. In 2011, Le Boat introduced the Vision -- an exclusive line of boats in its luxury 1500 series. Sleek and elegant, the Vision line was designed by Groupe Bénéteau in partnership with some of the world’s leading marine manufacturers. They feature the very latest in green and marine technology, including a solar panel for free green energy. Available in both hybrid (diesel plus electric) and non-hybrid (diesel-only) models, Vision is setting new standards for luxury cruising on Europe’s waterways. Beyond being efficient and green, the Vision line is easy to maneuver. It features a patented joystick on the upper deck which controls a unique underwater pivotal steering pod instead of a rudder. This allows the driver to steer and turn the boat in all directions with just a few movements -- making navigation seem effortless. As Europe’s leading self-drive boating company -- serving France, Germany, Italy, Ireland, Belgium, Great Britain and more -- Le Boat offers wine tourists a myriad of self-cruising options, but none is more popular than Canal du Midi. Wine tasting, eating at waterside restaurants, touring medieval ruins, window shopping, beach walking, and discovering unique museums are just some of the ways they spend the day -- all at their own pace. The options are endless. Some guests hire a captain and chef to drive the boat and prepare the dinners. Others rent bicycles from Le Boat and enjoy excursions through the vineyards and countryside. Still others attend culinary classes and seminars. They all share one thing in common -- they experience Languedoc-Roussillon wine country at a relaxed, leisurely pace and create memories that will last a lifetime.